Andhra Pradesh School Education Department has Online application for DEECET - 2017 are invited from candidates who intend to take admission into two years Diploma in Elementary Education (D.EL.Ed) in Government District Institutes of Education & Training (DIETs) and Private Elementary Teacher Training Institutions in the state to be conducted by Dept. of School Education, Govt of A.P on 04-05-2017 to 07.05.2017 in all 13 Districts of the state of A.P. 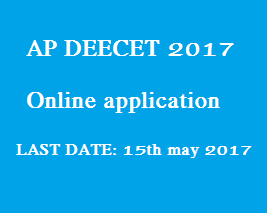 AP Deecet 2017 Online application Last date extended. Good News for all Deecet 2017 applicants, Andhra Pradesh School Education Department has Payments and Online Application Submission are extended upto 15-MAY-2017. It is really Good News for applicants for applying AP Deecet 2017. Candidate should have obtained a rank in DEECET-2017 and should satisfy the eligibility criteria prescribed. Age Limit: The candidates should have completed 17 years as on 01-09-2017 . There is no upper age limit. The candidate who passed or appeared for the 10 + 2 during 2016-17 final Examinations (Qualifying Examination) or its equivalent are eligible to appear for the entrance test .But, they should have passed the qualifying examination by the time of admission.